Kidderminster Carriage Shed is located on the Kidderminster site out of sight from the Station platforms. The shed is both a carriage storage and maintenance building, and was constructed between July 1999 and April 2000 with financial assistance of £1,757,000 from the Heritage Lottery Fund. In 1979, five years before the extension to Kidderminster was possible, plans were first drawn up for a carriage shed at the Stourport Triangle. Discussion of these plans continued into 1980 at which time it was hoped to begin site clearance in 1981 once the route of the Bewdley by-pass in the area had been completed. The proposed carriage shed was to have been a steel-framed building with three roads, 630ft long and costing at least £150,000. However by spring 1992 plans had been deferred due to other priorities including the extension to Kidderminster. Following the successful extension to Kidderminster and completion of the first phases of the new station building, new plans for a carriage shed at Kidderminster emerged. An application to the Heritage Lottery Fund titled the ‘SVRSevern Valley Railway Heritage Project’ was submitted on 30 April 1997 seeking funding of £6.5m. The carriage shed was to be a traditional style building, while the application also included a locomotive display building for both steam and diesel locomotives, an extension to Kidderminster Footbridge to allow better road and pedestrian access to the site, and a 10-year carriage restoration plan. A consequence of the application was that the articles of association of SVR(H) were amended to become a non-profit distributing organisation in order to qualify for lottery money. Fundraising including an SVRA raffle had raised over £100,000 by spring 1998. However the HLFHeritage Lottery Fund (National Lottery Heritage Fund from 2019) requested a scaled-down application which was submitted on 12 August 1998 at a value of £2.4m. Plans for the locomotive display building were dropped, while the carriage shed became the modern design with a single span curved roof eventually built. The footbridge extension and restoration of carriages were still included, although ultimately these too were dropped. On 12 May 1999 the SVRSevern Valley Railway announced that it had been awarded a grant of £1.757m towards construction of the carriage shed, at the time the largest grant made to a heritage railway. Planning permission was granted on 22 June. Further fundraising secured another £170k within 2 months of the grant, reaching 75% of the partnership funding required and allowing contracts to be signed with the design and build contractors Tarmac Building (later Carillion). Construction by the contractors began on 20 September 1999 with erection of steelwork beginning on 20 September. On 1 November the partnership funding target of £586k (25% of the total cost) was achieved. Construction was completed with the keys being formally handed to the SVRSevern Valley Railway by the Carillion site manager on 19 April 2000; the same day saw the first rake of carriages propelled onto Road 1. Track installation inside the shed by the P Way department was completed by the end of June 2000. The SVRA 'Millennium raffle' in April 2000 raised around a further £18,000 for the project. This and other additional fundraising secured sufficient money to allow SVRSevern Valley Railway(H) to announce at the 2000 AGM that the extension to Kidderminster Footbridge would go ahead. However the 2000 boiler crisis led to these plans being put on hold, since when they have never been resurrected. A plaque on the side of the shed commemorates its formal opening by HRH The Duke of Gloucester on 29 November 2001. The shed has 4 internal roads, and is flanked either side by two uncovered sidings. The shed is almost ¼ mile long, and is able to house up to 62 carriages. From left to right, the roads are numbered from 1 to 6. Roads 1 and 6 are the uncovered external roads; Roads 2 and 3 offer maintenance facilities, with there being a pit on road 2 for undertaking running maintenance. Finally roads 4 and 5 offer further maintenance, but contain a platform in the first half of the shed, which is able to facilitate the cleaning of the rolling stock. During 2017-18, Road 1 was used to house the Northern Belle rolling stock. Located outside on Road 6 is the railway's carriage washer, which is used to keep the stock in a clean external condition. The facility has proved priceless in maintaining the rolling stock in the high quality condition in which our visitors find it, and to which the railway's volunteers restore these historic artifacts. 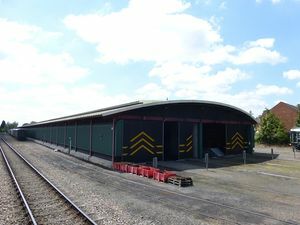 The shed is also used to provide covered accommodation for other stock. In recent years this has included non-operational diesel shunters (such as D3802 and 08896) and steam locomotives (such as 5764). It also was used in September 2016 to paint 813.